Is watching a Dan John lecture on DVD the best fun you can have on your own? In my world, it probably is. I spent a delightful Saturday night in the company of the Yoda of strength training, listening to him give away a lifetime of wisdom with humour, clarity and purpose. 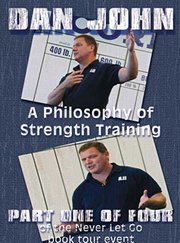 Dan John is a wonderful public speaker, a very knowledgeable strength coach and a warm, generous person. I can’t think of a better combination for a training seminar. Although he loves to experiment and to learn himself, Dan John is in fact the opposite of faddy. He has this uncanny ability to pick out the eternal, simple truths from whatever system or method he is discussing. I don’t think there’s much point my going into the details of what he talks about (but see end of this post anyway!). This sounds odd but it’s not really relevant. Saying Dan John covers ‘goal management’ and ‘phasic and tonic muscles’ in his lecture is like saying that Shakespeare covers ‘bereavement’ and ‘fencing’ in Hamlet. Technically this is true, but that doesn’t explain what the lecture is about or what you will get out of it. It is worth saying however that, although much of Dan John’s experience is in coaching athletes, he does have a lot to say to people who are simply training for muscle building and/or fat loss and their long term physical health. His advice isn’t sports specific, it is general and applicable to a number of different scenarios (including one that seems to have been inspired by Romy and Michele’s High School Reunion. I’m not asking any questions…). So this DVD is for anyone who has been strength training for a while and who wants to carry on training for the rest of their life. In other words, for people who take their training seriously, even if it’s just a hobby. I think it is particularly useful for people who coach themselves as it will equip you with methods and concepts that can be drawn on throughout your training life. Dan John makes me want to dedicate myself to training for life, or reinforces that desire. I am sure he could also instill that desire in some people, but this is not the DVD where he does that. I think you have to have the desire already, but even if it is dormant or intermittent, this DVD will bring it out and rejuvenate it. The premise of this movie is ‘point camera at Dan John and let him talk for over two hours’. I could have listened to two hours more – heck, two days more. The good news for me, and all of you, is that there is more! This is only part one of a four part series filmed over two days. My cup is gonna runneth over, I can tell you. This DVD is now on sale in the shop. Get it here. Sign up to my newsletter to hear about more new products as they come in stock. Erm, having said there’s no point telling you exactly what’s on the DVD, here is a list of topics covered in case you really want to know. Dan John is just a bitchin’ dude. It is fun viewing to be sure. I guess it depends to a certain extent on what motivates you or pushes your buttons. I can be immensely motivated by what people say or write: it’s the words that resonate and have power. If this is true for you too, you’ll love this DVD. If you are motivated by music, demos, visuals, you might not love it so much! In which case check out the other DVD Everything’s Over My Head. something that’s needed onn the web, someone with some originality!